Searches for Santa's equivalent in Eastern Europe displays none of the Christmassy diversity of the western half of the continent. Święty Mikołaj is largely found in Poland, Kalėdų Senelis in Lithuania, and their counterparts also largely stay confined to the borders of the states that imagined them into being. In fact, the diversity between variations on Santa Claus seems to have more to do with the relative dense of each country's cyberscape. 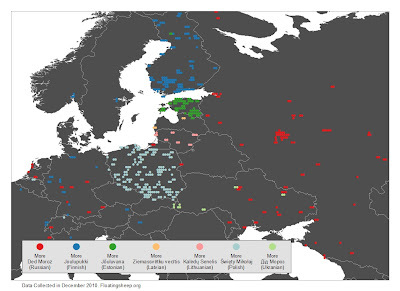 For example, it is likely that there are more references to the Estonian Jõuluvana (green dots) than the equivalent terms in neighboring countries simply because Estonia has much higher rates of Internet penetration. There are however, some interesting exceptions to the balkanisation of these Eastern Santaspheres. Ded Moroz (Дед Мороз), in particular, seems to stray widely from his Russian base. He is far more visible in Ukraine (particularly the Eastern portion) than his close cousin Дід Мороз (Did Moroz). He also seems to stray into Moldova, Germany, the Netherlands, and even eastern France. Despite his broad geographic mobility, Mr. Moroz is totally absent from many countries containing sizable Russian minorities (e.g Russians in northeastern Estonia, and parts of Latvia). Also worthy of mention is that Joulupukki, the Finnish Santa, appears in virtual santascapes across the continent. Is he fleeing the harsh Finnish winter? Avoiding yet another karelian pie? or simply picking up a diversity of presents for all the Finnish children who can't bear to see yet another moomin?